An "Editors' Pick" at CDbaby.com! Hear a message from Jeff. WELCOME TO A SOLO PIANO MUSIC LOVER’S GREAT ESCAPE. First of all, thank you for visiting PurePiano.com! 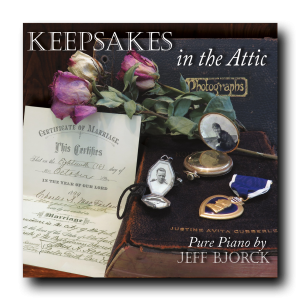 This is Jeff Bjorck’s official website featuring his signature “quiet music to calm the heart in a noisy world.” You can LISTEN for hours as you explore the STORE for SHEET MUSIC, MP3s, and CDs. Bjorck is a pianist, composer, and arranger with six solo piano albums to his credit. In addition, he is also a clinical psychologist and professor, and his emotional sensitivity shines through his playing. Four of Jeff’s albums primarily feature his original peaceful piano music compositions. 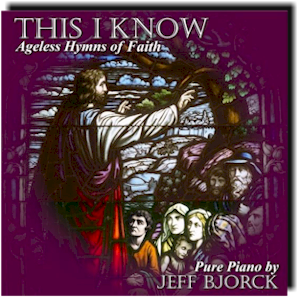 Another album contains 15 original classic hymn arrangements, and the sixth album includes 12 Christmas carols. Finally, rest easy while you surf this entire site safely and shop securely at Jeff’s online store. 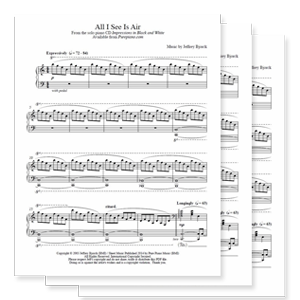 Piano music MP3 downloads and relaxing piano sheet music PDFs are both for sale as instant downloads. Peaceful CDs are also available, and they ship either first class or priority mail, so your music arrives fast! Thanks again for stopping by! Enjoy your visit and tell a friend!